Jason Voorhees is getting his very own slasher-puzzler! But… we’ve known that for months, so why am I writing about it again, aside from, you know, sharing the release date? Well, mainly because the new screenshots has me curious. 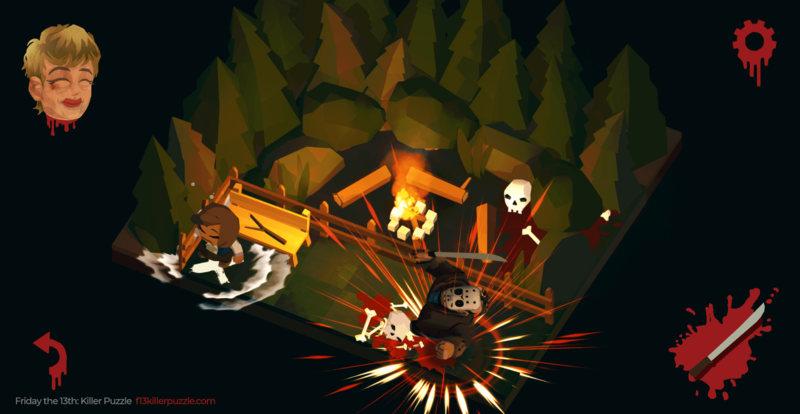 Unlike its precursor, Slayaway Camp, Friday the 13th: Killer Puzzle looks to be about more than sliding around to kill youngsters in gruesome ways. I could be wrong there, obviously, thinking too much into it. But I don’t think so. Look at the screenshot above, for example. What’s the deal with Jason’s mother’s head in the corner? What indeed. We’ll see once the game hits various digital platforms this April, I suppose. At least the weapon indicator in the opposite corner makes sense: different locales, different Jason, different weapon with which to wreak absolute havoc. Simple enough. But that head, not to mention the ‘aura’ around Jason? Yeah. Weird. Grisly reflex-based “Kill Scenes” punctuate the puzzling as you progress through multiple episodes, from classic campgrounds to more exotic locations such as Manhattan, abandoned amusement parks, supermax prisons, beach resorts, outer space and even, through a time-travel twist, Victorian London and other eras. Aside from that though, it seems this one will play much like Slayaway Camp, in that you’ll be sliding Jason around each level, finding the fastest route to unsuspecting victims while avoiding putting everyone’s favorite slasher into an unwinnable state; or, you know, get gunned down by some trigger-happy punk. Not that Jason cared much for bullets last time I checked, but there ya go. Friday the 13th: Killer Puzzle is heading for Steam, Google Play and iTunes on April 13, 2018.